The Use of Novel Surgical Scalpels Is Expected to Accelerate the Growth of Surgical Scalpel Market from 2018 to 2025. The global surgical scalpel market is witnessing a sheer rise in the current scenario and is expected to expand in the coming years. The current scalpel technology involves use of conventional stainless steel and other metals. In case of patients undergoing various procedures, the body may show side effects of the surgeries performed. Moreover, the disposal process for one-use stainless steel (SS) blades is expensive. Several research is being carried out to innovate the surgical scalpels. In the recent years, there has been an increase in research to develop new varieties of scalpel to reduce the pressure on the surgeons and also decreases the time of the surgery. European researchers set out to develop a process for manufacturing high-quality disposable polymer-based surgical blades. The researchers aim to enhance surface sharpness by 40% compared to existing SS blades and to demonstrate stiffness, sharpness and wear resistance comparable to that of SS blades. In addition, a novel hot plate disposal system would make the blade ‘sharp safe’ in less than a second within the operating theatre itself, greatly simplifying the disposal process. Furthermore, an alternative of the currently used technique for dissection of paced patient is the ultrasonic scalpel (US). The scalpel is used for first time in a patient with implanted pacemaker undergoing open-heart reoperation. Thus, various R&D activities for the development of new and innovative techniques for surgical scalpel are anticipated to be an aspect in the surgical scalpel market in the years to come. In our study, we have segmented the surgical scalpel market by product, type, material, and end user. Based on product, the market is segmented as disposable scalpel, reusable scalpel and accessories. 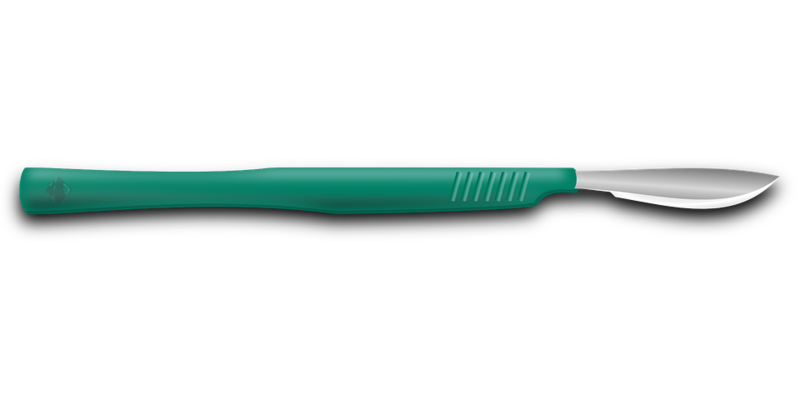 The disposable as well as reusable scalpel is further segmented as scalpel blades and scalpel handles. Based on the type, the market is classified as, standard surgical scalpels and safety surgical scalpels. On the basis of material used, the market of surgical scalpel is segmented as, stainless steel, high grade carbon steel, and other materials. Based on end user, the market is categorized as, hospitals, ambulatory surgical centers, nursing centers, and reference laboratories. Geographically, the market for surgical scalpel is segmented into North America, Europe, Asia Pacific (APC), Middle East and Africa (MEA) and South and Central America (S&CAM). Furthermore, North America surgical scalpel market comprises of combined markets for the US, Canada, and Mexico. In the recent years, all the three countries are witnessing a progressive change in the surgical scalpel market. This region has largest market share of the global surgical scalpel market, by geography. Factors such as increasing focus of market players in the US and Canada, funds by the government in US and presence of regulatory bodies is anticipated to boost the growth of surgical scalpel market in North America. The major players operating in the market of surgical scalpel market include B. Braun Melsungen AG, Integra LifeSciences Corporation, Hill-Rom Services Inc., pfm medical ag., Ansell, Swann Morton Limited, Medicom, PL Medical Co., LLC, Southmedic, and Kai Corporation. and Kai Industries Co., Ltd., among others.